Lighter, stronger, more fuel-efficient airplanes; more powerful, better targeted drugs, and paper thin high-definition televisions – it has all become possible as scientists became adept at the manipulation of tiny ‘nano’ particles. The possibilities from nanotechnology are exciting, but it crucial that proper safety tests are in place. Professor Stefano Sanvito, Deputy Director of CRANN at TCD, wants Ireland to become a ‘hub’ for such nano testing. Stefano, as the name suggests, is Italian, and graduated in physics from the University of Milan ‘about 15 years ago’. He was interested in science from when he was ‘very small’, and he has pedigree for the field. His father, who is now retired, was an engineer who worked in the sewing machine industry, while his grandfather worked in R&D for ‘big pharma’. His interests, while at secondary school, were not only in the sciences, as he also developed a liking for philosophy. In fact, his first choice of career was to become a writer, and towards that end, he applied to study at the renowned Scuola Normale Superiore di Pisa. The standards for entry to the Scuola were, and are, high, with only about 6% of applicants gaining entry. Stefano didn’t make it, and then focused on his other big interest – physics. He gained entry to the University of Milan to study physics and maths, but that was easy part. Though some 500 fellow students were also admitted at the same time, only about 50 of them would later pass the exams at the end of the year and make it into second year. It was a brutal ‘sink or swim’ test for the mainly teenage group of students. Stefano recalled that there was no help provided, no structure for students, and the pressure was immense. He found the going extremely tough, especially the lab work, yet he passed his exams. That first year in college wasn’t at all enjoyable, as the work needed to get into the top 10% of the class was huge, while most of the physics course was of the ‘old school’ variety. It wasn’t until 3rd year, when began studying modern physics, and areas such as quantum mechanics, that things began to get interesting for him, and his talent found expression. He doesn’t recall any event in particular that triggered a flourishing of interest in science at any stage of his life, but he did have a mentor, while at university that was a big influence on him. This was his fourth year supervisor, who oversaw his final year undergraduate project. He was a difficult man to deal with on a personal level, recalled Stefano, but he was a stimulating character and a talented high-energy scientist. Certainly, he might well have been a difficult colleague, said Stefano, but as a supervisor and scientist, he was fantastic. He also gathered around him many big names of science, which made things even better. The final university year was an enjoyable experience thanks to his colourful, difficult supervisor. Then, with his degree in his pocket, he looked around for his next option. He wanted to continue in research, and do a PhD, but he wanted to do it outside Italy, and preferably in an English-speaking country. He chose to go to the UK, where he secured support from the British Ministry of Defence (MOD) to study ‘giant magneto-resistance’. The force called giant magneto-resistance was discovered in 1988 – independently, yet at the same time – by research groups led by Albert Fert and Peter Grunberg. The two men were awarded the Nobel Prize for Physics in 2007 for the finding. The term describes how the resistance of certain materials to electrical current drops dramatically as a magnetic field is applied. The word ‘giant’ was tagged on to ‘magneto-resistance’ part because the scientists wanted to describe something that was a much larger effect on current than anything that had ever been seen in metals. This giant magneto force has since been used to improve the storage capacity of computer disks, car sensors, and many other devices. The MOD wanted to use giant magneto-resistance forces to develop a new ‘solid state’ compass, and that’s why they funded Stefano’s PhD into this area. A solid state compass is a small compass found now in clocks or mobile phones that are typically built using two or three ‘magnetic field sensors’ that pick up the Earth’s magnetic readings, and send that data to a microprocessor. They can provide a very accurate positioning method. Stefano’s PhD was awarded by the University of Lancaster, but he spent two out of three years working towards his doctorate based at an MOD site near Malvern, Worcestershire, a town of about 28,000 people located approximately halfway between Birmingham and Bristol. This site was home to the Royal Signals and Radar Establishment, the group that had famously developed the radar, which helped the RAF win its life or death struggle with the Luftwaffe in the 1940 ‘Battle of Britain’. The group had moved from the south of England to Malvern in 1942, where they worked under the protection of the 600-metre tall Malvern Hills. The British had, by 1942, become concerned about the threat of a ballistic missile attack on its military bases in southern England from Nazi- Occupied Belgium. At Malvern, Stefano did ‘atomistic simulations’ for ‘sandwiches’ of different materials. In other words he analysed how magnetic affected current running through various materials. It was possible to get a different current in a material when the magnetic ‘configuration’ changed. This Nobel Prize in Physics in 2007 was awarded to Fert and Grunburg for being the first to demonstrate that an electrical current could be hugely changed by changing the magnetism of a magnet. This knowledge was used to build improved computer disk drives, and today every computer or disk drive is based on this principle, in a market worth $ 7 billion. It’s an example, said Stefano, of how basic research can lead to economic gains. After his stint in Britain, Stefano was very keen to follow a long held dream to work as a scientist in the USA. He felt the best time to do that was after the PhD, and as a post-doctoral researcher. “There is excellent science in Europe, but there is a ‘can do’ attitude in the US that has no match anywhere in the world – maybe Israel – and I wanted to see that in action,” said Stefano. He applied and was accepted to do research at the ‘top 10’ listed University of Southern California Santa Barbara, and found it “the absolute best place”. He found the scientific culture to be fantastic, the climate was superb, the mountains and sea were nearby, he was mingling with Nobel Prize winners – USC Santa Barbara had three winners in his few short years there alone – and his office was 100 metres from the beach. He spent two and a half years living out his California dream and while in the lab he was working on putting magnetic impurities into semi-conductors and seeing what happened. California would be hard to top, but his next move was crucial, as, after the post-doc Stefano was seeking his first staff job as a scientist. He researched the options, and saw an ad for an opportunity to work at the CRANN Institute at TCD in Dublin where he knew a renowned researcher was based – Professor Michael Coey. The package was attractive in terms of equipment, funding and personnel resources. The couple were keen too, to return to Europe, any part of Europe, in order to raise their family. Ireland seemed a good bet. 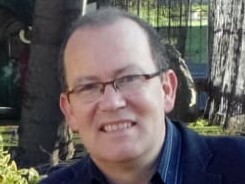 In 2006, Stefano and his wife, and two boys moved to Dublin, where he was appointed as Associate Professor in Physics, later becoming Deputy Director of CRANN in 2009. He began working closely with Professor Coey, but set up his own research group. Stefano’s group was focused on investigating the properties of nano materials. More and more companies were making nano-devices, and using nano-materials, and he developed a testing service, based on unique mathematical algorithms built into simulation software programmes, which are available to download, for companies located all over the globe. “I have to admit that I moved to Ireland because of serpendity,” said Stefano, who is now well settled here with his family. “I wanted to move back to Europe, and my position at Trinity was the first one I could secure. However, I probably wouldn’t have moved to any other place in Ireland except Trinity because of the reputation. A second factor to steer my decision was SFI [Science Foundation Ireland]. SFI essentially started those days and it was clear that they could provide great opportunities for young scientists. I am afraid that this is not the case any longer,” added Stefano. As for the future, Stefano belives that nano researchers will become increasingly able to systematically predict new materials and new material complexes ahead of experiments. Nano science will not stop there, of course, and be believes the next stage after that will involve researchers making predictions about materials with applications in mind. For example, scientists might predict a new material – that does not yet exist – for making magnets that can be used in electrical moters. Then people will make it in the laboratory. These new materials will be predicted and designed using computers, and new software. This means an age of vastly superior new materials – designed exactly for purpose – lies ahead of us. Tehse new materials will need to be tested before they can be applied in the real world. CRANN is already known for its ability to simulate tests on nanomaterials, and Stefano wants to extend that expertise to a range of new nanomaterials coming online. This can help manufacturers by proving whether certain nano materials are really up to scratch, whether they will work in nano-devices, while also assuring the public about ‘nano safety’. First published in the March 2013 edition of Science Spin. Next Boredom – It really is a killer!